Dr. Husseini attended medical school at Damascus University in Damascus, Syria. He did his internship at Jamaica Hospital in New York. He completed his residency at Henry Ford Hospital in Michigan. Dr. Husseini is board certifid by the American College of Obstetrics and Gynecology. 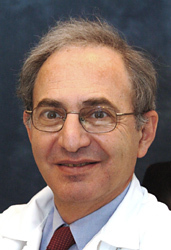 Dr. Husseini has been ... Read More in private practice for over 28 years. He is practicing advance gynecological laparoscopy surgery. He is a solo practicing physician. Dr. Husseini performs all his own deliveries. He is a caring person to person physician. Some of the common procedures he does laparoscopically include: - Removal of ovarian cysts and uterine .broids of any size and number with minimal blood loss and minimal scarring - Removal of the ovaries and/or the uterus - Treatment of ectopic pregnancies - Diagnosis of endometriosis and removal of endometriomas - Reversal of tubal ligation and lysis of tubal adhesions - Evaluation of undiagnosed abdominal pain - Bladder neck suspension to treat stress urinary incontinence. Over 85% of procedures are done as an outpatient basis.